It wasn't more than a few years ago when all we knew of the protodinosaurs could, as with early hominine evolution, be housed in a single museum drawer. These scanty specimens belonged to two genera from the Middle Triassic of South America: Lagerpeton and Marasuchus. Six major phylogenetic groups (five clades and the basal archosauromorphs) converge here, revealing the density of the phylogenetic traffic at this crossroads. There are very few places like this in all of vertebrate phylospace. Two of the others are well-known landmarks: the radiations of the gnathostomes and the amniotes. Each of these represents some well-understood physiological transition which drove a radiation downstream from the first animals to achieve a particular set of (probably related) adaptations. We will make the case, largely based on the recent work of scientists like Hutchinson, Gatesy and Blob, that something almost as remarkable might have been at work in the re-engineering of the dinosauromorph hind limb. However, this seems simplistic. The pattern of cladogenesis is different here, perhaps more like the mammaliforms, which exhibited a kind of accellerating tendency to generate long-lived, rather unique groups of organisms over quite a long period of time, culminating in the Early Cenozoic radiation of the placental mammal (Eutherian) orders. So much of this large-scale pattern-drawing could be an artifact of the spotty fossil record that it seems unwise to speculate much further. Still, there was something plainly remarkable going on. We can hope to gain some insight about that development by a more detailed study of these two fossil forms from Argentina. They are not so remarkable in themselves, but they do seem to be squarely at the epicenter of an evolutionary earthquake. Painting © Doug Henderson, reproduced with permission. Probably no creatures that have lived upon this Earth have excited the imagination more than the Dinosauria. For some 150 million years they dominated ever medium to large to gigantic terrestrial vertebrate ecological niche, evolving into a wide range of forms and populating every continent. Perhaps because they often had such bizarre forms, perhaps because they sometimes grew to such huge size, perhaps because after ruling this earth for so long they suddenly vanished, seemingly without a trace; all things add to the appeal of the Dinosauria in the popular -- and scientific! -- imagination. As wonderful as the dinosaurs are, even these facts have to be qualified. True, many dinosaurs did have rather strange forms, but were they any stranger in appearance than, say, a giraffe or an elephant? True, many of them did grow to be quite large and even enormous, but no dinosaur ever rivalled even the smaller baleen whales in size. It would in fact be physiologically impossible for a land animal of more than 100 tonnes to exist (it's legs would have to be so massive they would touch, leaving no space for the body between!). So much for Godzilla and the dinosaurs of One Million Years B.C. (a cult film better known for a much smaller, but equally impressive, 60 kg and 180 cm Rachel Welch in a fur bikini) - such creatures belong to the realm of Hollywood fantasy. 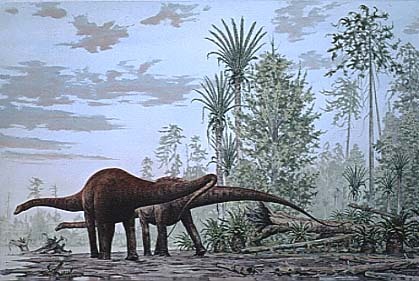 The majority of dinosaurs were actually medium-sized creatures, equivalent to modern medium to large mammals in size. Finally, as for dying out without a trace, this is also incorrect. One lineage of small insectivorous or /carnivorous dinosaurs did survive the great Mesozoic terminal extinction and are still with us today. They're called birds.